Santiago de Cuba Our flight into Santiago de Cuba in the SE corner of the country can only be described as hysterical. We were loaded onto the Aerocaribean plane, vintage circa 1070. As we took off, one Cuban was on the phone, another was texting and yet another had his traytable down! No attention paid by the airhostess. Our frantic attempt to get her attention just got a cool gaze, and a later explanation that none of it really matters! The Cubans on board treated the plane as a walkabout space, and groups of women in tight clothes converged in places, conversation flying. We stepped out into the hot night air, and underwent a rigorous security check. There were police, armed guards and sniffer dogs everywhere. Cathal had to get a special licence for his walkie talkie! Many Cubans were having their bags thoroughly searched, as they are only allowed to bring in a certain value of goods to the country. We had to change some of our Canadian dollars into local currency. 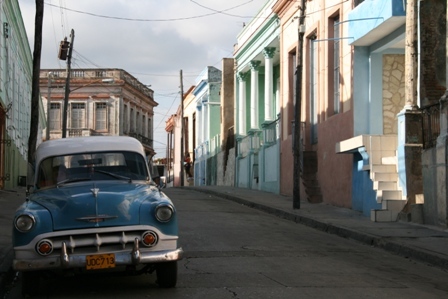 There are actually two currencies in Cuba. 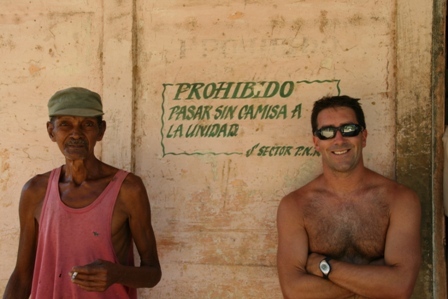 The first is the local peso, that Cubans use. One peso is worth about 4 euro cent. The second is the Convertible peso, equivalent to hard currency, introduced after the US dollar was outlawed a number of years ago. 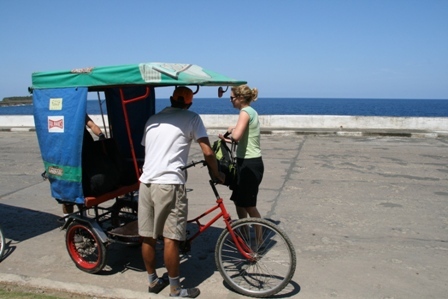 The Convertible, or CUC as it is known, is worth 25 local pesos. This leads to a confusing and complicated double system, with locals doing anything they can to get tourist business, as it is worth on average 25 times more than the local business. We managed to procure some local pesos as well as the CUCs, useful for tipping, buying at markets and local food stalls. We took a Lada taxi into town. 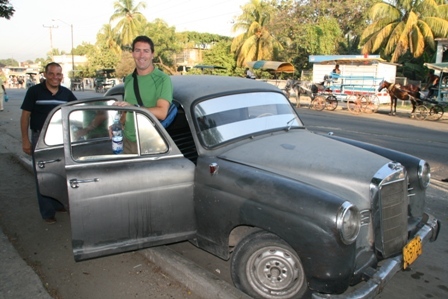 The Lada proved to be quite souped up inside, with a blue flashing CD player blasting out Cuban tunes. We were deposited at our Casa Particulare. 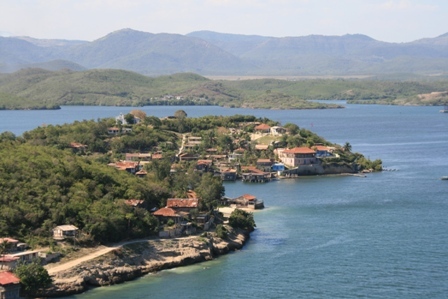 This is the Cuban answer to a tourist bed shortage, it is a B/B arranagement where tourists stay with Cuban families. The system is rigorously administered and the hosts pay high taxes for the privilege of acccess to tourist CUCs. A casa can rent a maximum of 2 rooms. David and Betty were our hosts, to our delight they spoke English! They live in a lovely colonial’era house in the old centre of Santiago, with Betty´s parents and their two children. A quick Mohito in the Casa Grande hotel on the Parque Cespedes (central square) and we were ready for sleep! 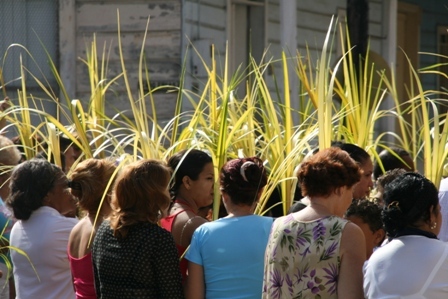 There are many discreet ´offices´visible through doorways, filled with officials shuffling paper and anxious Cubans queuing. Ration books are a way of life here, but one cannot survive on the rations alone. Salaries are ridiculously low (20 dollars a month max), so buying power is poor unless you have access to tourist dollars. Because of this, a barman in a touristy hotel will earn far in excess of a doctor or a teacher, who are forbidden to leave their professions and join the tourist trade. We spent a couple of days exploring what Santiago has to offer. 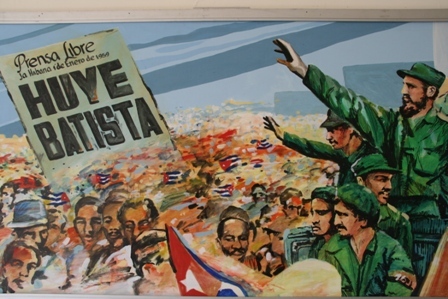 We visited the Museum Moncada and Santamaria, both dedicated to the Revolution. 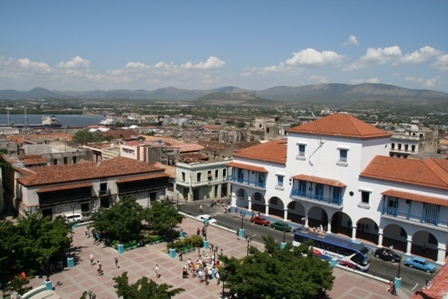 Both were set in lovely buildings, with a view of the Sierra Maestra mountainrange to the north. We also visited the oldest house in Santiago, and got an enlightened tour in English from a local guy. The house dated back to th 1500s, and had seen many famous people pass through. The view from the Casa Grande Hotel rooftop restaurant proved arresting, a 360 view of the town, the sea, the mountains behind and a great expanse of blue sky. 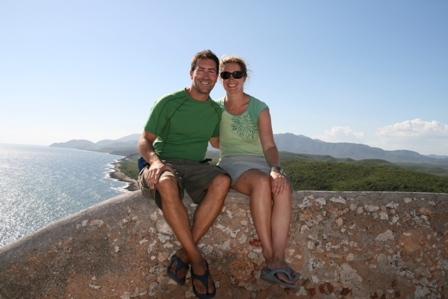 We took a taxi (extremely dodgy ancient Toyota) to El Morro Fort, 16K outside the town. An impressive structure dating from the 1700s, we took a short tour around and admired the view. Our ´guide´was not at all official, but it worked out cheaper than the real type! We saw local jinteras in operation. 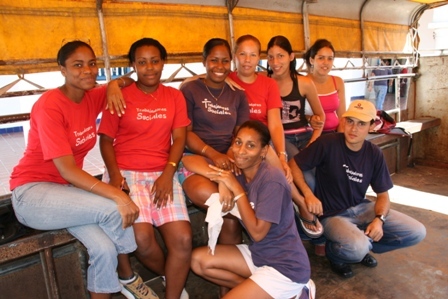 These are pretty young local girls who attach themselves to older male tourists, for monetary or material gain. It is tourism at its worst, but proves so lucrative for the girls that the government has been unable to stamp it out. OK well this girl is in Havana, but you see what we mean? 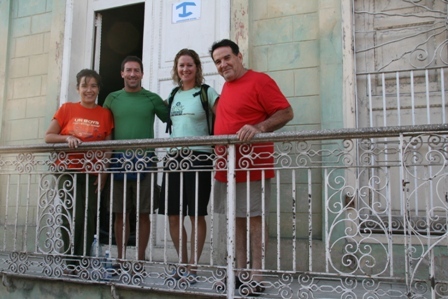 Cuba is not known for its food, but nevertheless we were impressed with breakfasts and dinners turned out by our casa. Also we could get ´peso pizza´for 5 local pesos (about 16 cent) as a filling snack, or peso icecream which is extremely popular with the locals. We just had to look for a queue, and would find one of the two delicacies at the top of it! 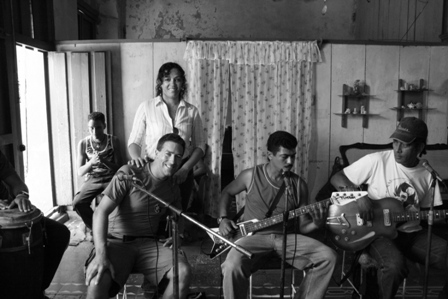 Music proved excellent at the Casa de la Trova, and we were one morning invited to join a group who were practicing near the Padre Pico steps. I tried to play a percussion instrument that resembled a cheese grater played with a large wiry fork. 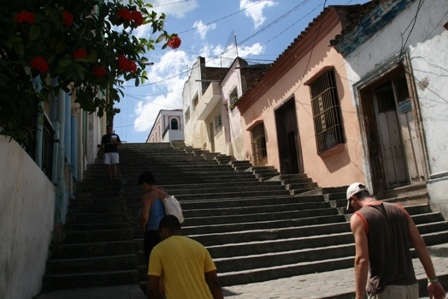 On 13 March we took a Viazul bus at 7am bound for Barracoa, a town 5 hours to the east. It used to be only accessible by boat until the winding Farola road was built. 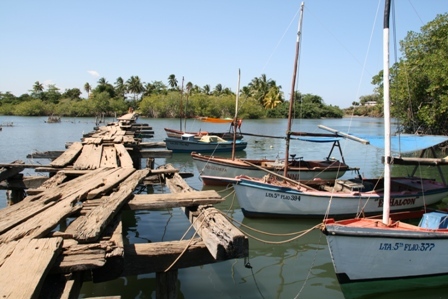 Our passports were required to board, our route is followed by authorities wherever we go. The journey was very picturesque, and we were met by our host at the station. We were brought by Bicitaxi (a tricyle that has two seats behind the driver who cycles) to our casa. 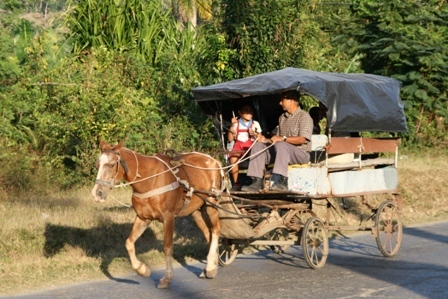 A lovely way to travel, it is shaded from the sun and you get a nice breeze! 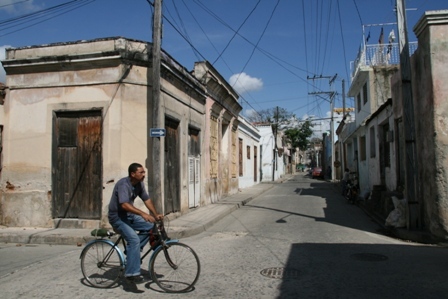 Our casa was right in the Centre on Ave. Maceo. 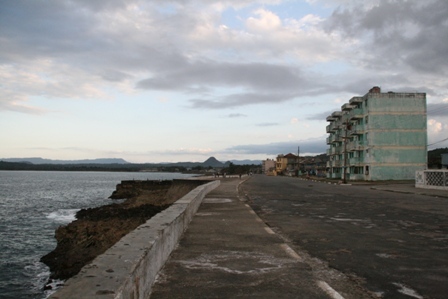 Baracoa is smaller than Santiago, but appears busier as everybody walks or cycles, and there is constant conversation. We wandered around in the late afternoon, enjoying some peso pizza and seeing everybody eat the same yellow iced cake! Apparently they are centrally baked for occasions. We walked along the Malecon, the name for the sea road. In any other country it would be fabulously developed, but here Soviet style blocks competed with ramshackle houses for the view! We ate dinner at a Paladar, or private restaurant. Most eateries (and hotels) are government run, so a private one was nice for a change. 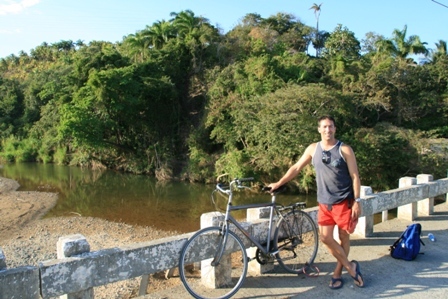 The next day, 14 March, we hired bikes for 3 CUC each and set out for Playa Maguana, 20K north up the coast. The cycle was very enjoyable. A breeze kept the heat down, and there was little traffic. 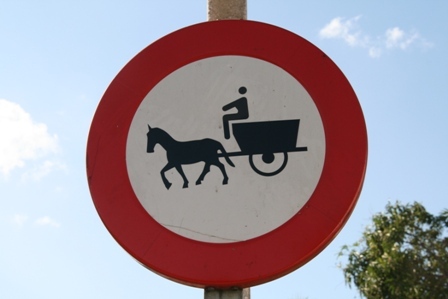 Most other road users were on bikes, horse and cart or oxen and cart. We passed a chocolate factory, nice smell, and a bread factory. Socialist signs and slogans were everywhere you looked ‘ one wonders if they are placed by government or the residents themselves. 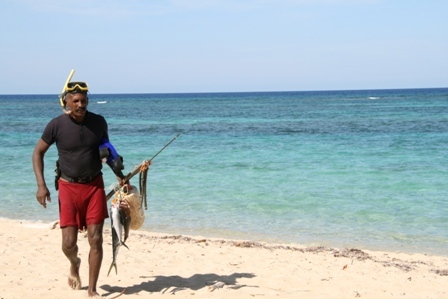 After 2 hours we reached our destination, the white sand classic caribbean beach of Maguana. We passed several enjoyable hours here chilling on the beach. The cycle back rendered our backsides rather sore (not used to cycling at the moment!) 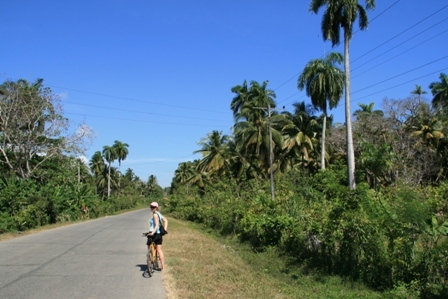 but the views of the sea and lush countryside of palms and banana plantations made it easier. 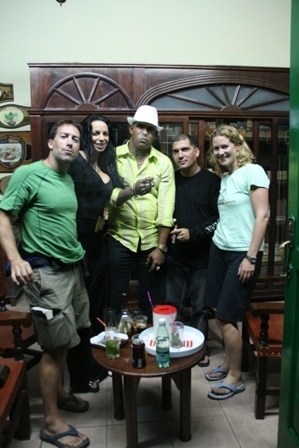 We partied Cuban style that night with new friends, at a bar where you can only buy rum by the bottle! I salsa danced very badly with Giovanni, a local whose Dutch girlfriend was staying in our casa. The locals are all extremely fluid and flirtatious in their dancing, its all very suggestively Latino! The next day we wandered around the Saturday market. Meat was extremely coveted and the queues were long, I think beef is a rarity here, and protein is craved by all Cubans. The Special Period in the 1990s were very lean times here, and that recent memory means they all like to stock up just in case. We visited another beach today, the Playa Blanca. To reach it, was passed the baseball stadium which backs onto the black sand town beach. Then we crossed a rickety bridge, walked through a village and then got to this little cove with perfect clear blue Caribbean waters. Casa de la Trova that night entertained us with great music, our waiter was a crazy Cuban with a love of foreign magazines and a mullet hairstyle to beat all mullets! We chatted to a Dutch couple for the evening. The next day we prepared to return to Santiago. The Viazul bus system is a little crazy, we couldn´t book tickets but were told to arrive at the station an hour early and we might get on. As it turned out, it was no problem, there were many free seats on the bus. So, we got to pass the last morning in Santiago hanging out at the Hotel El Castillo, a hotel on a hill behind the town with a pool and a 360 view of the El Yunque mountain, the sea and the countryside far beyond. Beautiful. After a quick night in Santiago, we took an onward bus to Camaguey, 7 hours to the west. A long journey, but broken by stops in Bamayo, Holguin and Las Tunas. None really looked worth a visit! We left our bags at the station and took a bicitaxi into town to explore. Camaguey is a very pretty town, small and not that touristy. It was built in a labyrinthine manner in the 16th century to confusing marauding pirates who made a habit of attacking the city, despite it being 50K inland! We spent a couple of hours wandering around the pretty streets, observing that the many empty building were ripe for turning into chic cafes and shops if things every change here! We had to stretch the evening until our 2.25am bus to Trinidad, so we enjoyed dinner at a so’called Tapas Bar, where the only tapas involved the ubiquitous cheese and ham in various guises! A cabaret club entertained us until we had to leave for the bus. There was an airconditioned cigar house within the club, where we met two CubanCanadians enjoying fine whisky and the fattest cigars you ever saw! There were mafia types personified, one had a beautiful Cuban wife by his side and the other is a professional body guard in Toronto! Back to the station at 1am for our bus, we managed to sleep most of the way, and were met at the Trinidad station by our new host Estelle. A few more hours sleep and we are ready to explore again! I enjoyed reading about your Cubian adventure so far. Look forward to hearing more about it and seeing your photos when you get the chance to upload them. Great pics. You are both looking great. looks like you had a great time.